If I dont get the spell kit will the candles and oils be just as effective? It's hard for us to say which is more effective or just as effective. In my opinion, doing the work in the way that will help you and your purpose (not putting both your names in the same jar, giving each person their own spellwork) would serve you the best. 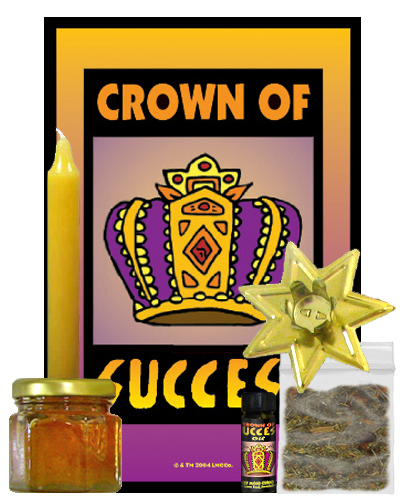 Does anyone know if the Crown of Success spell kit is stronger than the Crown of Success Honey Jar Spell Kit? Or are they about the same? That's not how magic works. Each spell kit is designed to be strong and effective, but comes at the situation from different angles. One is not stronger than the other. They both can be effective when Spirit determines that success is warranted. You could use one honey jar for all. But one per industry would have more chances of success with some of the companies. Yes, you can use your personal concerns. Sounds good. Thank you, Miss Aida! Would the CoS spell kit or CoS Honey Jar spell kit be the better option if i want more than one company to hire me/invite me for interviews? I know that I asked a similar question and forgive me if it sounds like I'm repeating myself. I just want to know which will be the better option before making my purchase. I recently bought and received a crown of success spell kit which I am pretty excited to use. I have a slight problem. My SO is definitely not open to hoodoo so I'm going to need to do the work in secret. Im planning on doing it a few hours before dawn when I know he will be asleep. Will the spell still be as effective as if I did the work right before dawn? Sorry if that is a stupid question. If your boyfriend would be upset enough to halt or sabotage the work, I say do it whenever you are able. Although that does always give me pause when I hear of a significant other being that controlling. Yes, I think that would be a good way to calculate it. Welcome to the Lucky Mojo forum! Sorry your last post was denied, I'm not sure what happened there (perhaps it was violating a forum rule). Let us know if it keeps happening. Thank you so much .... I have so much goodies to purchase! No, that is not how it is done. You are already sweet to yourself! This jar is to make others sweet to you! If you have no names, do you have people of some type -- co-workers, teaches, family members, or the like? Just describe them as a group. So in my last order I received a COS honey jar kit too. I was thinking originally of something generally for people to be sweeter to me to help my company achieve success. I'm currently in the process of opening it, and it's arts-related so a very very supportive network of people is imperative. That said, I'm friends with a few artists personally that have already declared support, some are one my social media so we interact almost daily. One of whom, I have the biggest fondness of. While he has some sort of private-thing going on and doesn't go to these networking-style events I personally love, he's a true artist, loved, very dearly, by everyone who knows him. He has this way to just draw love to him, and there doesn't seem to be a negative thing in his mind. He's supportive of my efforts and became my first "patron", but I'd love him to be more so, and louder about it (he does talk a lot about things that matter to him on his social media and to his friends (we do interact often on social media. I'm almost a bit too enthusiastic about all his posts, but he occasionally is with me too.. all of his friends work in the same art-circle of course), on a personal level, I'd like to become closer as friends. That said, due to his privateness, I only really see him when I run into him by chance or when we plan something creative together. I started thinking maybe I should also, specifically put him in there? I know for sure I'll be seeing him around Oct-November... May run into him before with some luck (currently burning a Good Luck Vigil for general luck and to get, quickly, money I'm expecting) - BUT of course I wouldn't know how to get any personal concerns of him. May manage to get his autograph since he knows I admire him so I can jokingly ask him for one he'll probably write something lovely though I'll be sad to never see again hah! But just thought of autograph, good idea to execute probably. If autograph is enough, is it possible to use it jar for both general sweetness from those I need it from, and for specific sweetness from him (I suppose with this jar I'll have to keep both career-related which is fine for me)? You can add specific people and a general statement about those to support you. I however would make the jar on myself to make me successful in everything that I do with this job, that customers are sweet to me, move me as a provider of services and loyal to me, that they speak well of me and share my information frequently, that they offer me opportunities to meet others in the client field. I would use more of a look me over product to draw the specific customers in along with attraction to draw them in. Youl would be very interested in these products as well. A sweet jar on yourself for success would make you sweet to success. But "success is just a concept, not a person." However, this is NOT traditional. You do not normally sweeten yourself unless you feel that you have a temperament or personality issue that makes you be sharp or sour. Instead, you sweeten others to be nice to you. Their names go in the honey jar, not yours. Lets say im applying fo a job, no idea the people in the interview. I would write a petition that states all those in the interview process will love me, support me and want me in this position etc. My petition is still to sweeten them to me, which is really the object of the purpose of the job, to make them like and come to me. Last question, why would you purchase a crown of success honey jar for someone else unless it was a person you working for? Of course it, the oil, products, and mojo can be worked on oneself. That is proprietary to lucky mojo and likely not to be shared. You can brows the website and look at success herbs and get a good idea on items that would likely be used. If you working for success, you may also be interested in bay leaves which are known for bringing success. I received my crown of success spell kit and upon taking the items out of the box, my nephew (a 18 month old baby) snatched the mojo bag and wouldn’t give it back . My mom saw how attached he was to the bag and we were shocked. Considering this happened, and I have yet to work the spell or even bring my mojo to life or handle the mojo at all, has my mojo died before I even got to breathe life into it? Intutively, I feel like since I haven’t activated the bag with life and my essence, I’m in the clear. I’m not sure. The bag is not alive till you bring it to life with petition, prayer, dressing it and preparing it. The shop also handled the mojo when they put it together and then sold it it to you. Dont be alarmed its not dead before starting. But also, now that you know the nephew has a strong hold and attracted to it, keep it hidden, safe and away!